Eleven days on, the blockade of fracking proppants at the Olympia Port holds strong. The blockade has grown from a makeshift barricade of pallets and tarps to a large encampment, complete with barrel fires, tents, food, medical supplies, and plenty of literature. Punk shows, movie screenings, and skillshares take place frequently, transforming the space from a simple blockade to a small piece of a future world. The blockade is not activism; it is a different life, glimpsed briefly every time we share food, stare down the police, and make the survival of all a common responsibility. This newsletter intends to be a record of the blockade–of the writings, events, and actions taking place near and far. 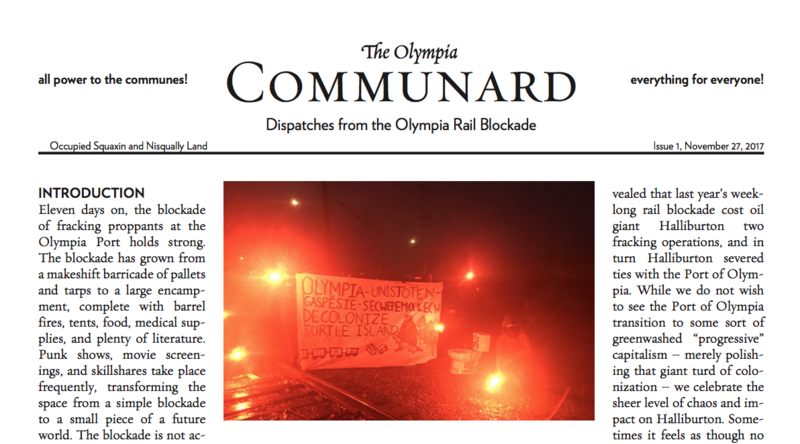 As Olympia Stand tends increasingly towards the Olympia Commune–a liberated space of mutual aid and free association–we want to illustrate that transformation. This newsletter is not representative of the blockade as a whole. It is simply the perspective of some future possible world, glancing back at the collapse of this world and searching for those elements of redemption hidden therein. Please print & distribute, far & wide!